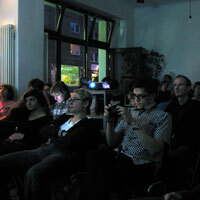 WebMontag is a monthly geek get together. Four people give ten minute talks on their pet projects. Being Berlin, beer follows. Last night, The Hype Machine founder Anthony Volodkin gave a talk introducing the MP3 aggregator to the city’s web geeks. Next up was HallenProjekt.de, a social network for flexible workers. Say you’re working in freelance mecca Sankt Oberholz. HallenProjekt lets you can see who else is working on the same network, what they do for a living, their current status etc. Seems like a great idea for solo workers if it can reach critical mass. The third talk was on Couch DB, a SQL database alternative sponsored by the Apache Foundation. Last up was Netzsprecher.de (private beta), a VoIP voice messaging community. Confused? Me too, but I’m sure it does wonderful things. I didn’t get a chance to speak to organisers Markus and Falk, so if you’re reading: thanks for a great evening!